He couldn’t breathe. Lakers centers Shaquille O’Neal had just dropped like a piano falling from the roof of a building, and courtside photographer Andy Bernstein was somewhere underneath him. The camera around his neck was crushing his lungs under Shaq’s massive frame and the two men were face to face. Outside of working on the bomb squad or fishing for crab on the Bering Sea, few occupations regularly put you in the direct path of collisions as crouching on the baseline beneath the basket of an NBA game. If ever there was a hard-hat area, this is it. It’s also where Bernstein, the iconic NBA and event photographer, has lived for the better part of four decades. 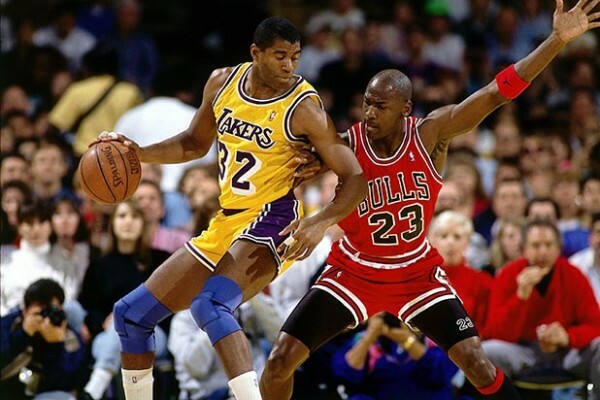 He went from New York’s boroughs to the University of Massachusetts to Art Center of Design in Pasadena before hooking up with the Lakers as a tenacious young sports photographer. A self-described “mensch,” Bernstein nudged his way into Pat Riley’s huddles with his camera during the glory years of Showtime basketball in Los Angeles, and he’s been a fixture under the hoop at Lakers games ever since. Like the time Nuggets guard T.R. Dunn took out Bernstein early in his career. The price basketball photographers pay to hang in there and get the perfect shot that’s later seen on magazine covers, websites, trading cards, and posters is steep. Occasionally the men tasked with capturing the action at live sporting events make physical contact with the games they cover, and the result isn’t pretty. Especially if it’s Denis Rodman. Bernstein sees his role under the hoop much differently. Game 1 of the NBA Finals tips off this week in Oakland, and Bernstein, as he’s been just about every year since the 1980s, will be there to chronicle every minute of every game. In that time, Bernstein’s been accidentally stomped more than once. But when giants aren’t falling out of the sky, he’s put together one of the storied portfolios in sports history. 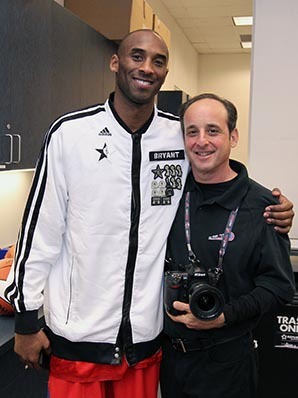 The director of photography for the Los Angeles Lakers, the Kings, the Clippers, and the Staples Center and Nokia Theater, he has captured some of basketball’s signature moments. He’s the guy who took many of the images you remember of the Showtime Lakers, the Bird Celtics, and the Jordan Bulls. 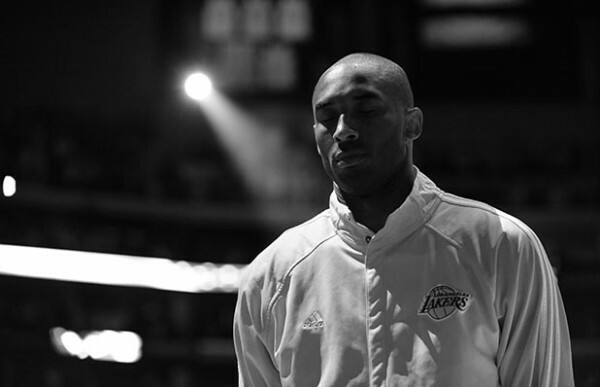 The Brooklyn product is an acclaimed lensman, a published author, and the authority on Lakers basketball imagery. Bernstein helped to establish NBA Photos, a division of NBA Entertainment, and is the longest tenured photographer in the league. After 33 years in the game, he essentially has a key to the building, and is able to go wherever he wants to get historic shots. It’s a type of all-access pass reserved for only the most trusted and gifted eyes, a kind of clout that is earned over decades in the game. Bernstein starts every day the same way. He’ll take his 6-year-old daughter, Mimi, to school before work. Mornings are generally filled with returning emails and working on long-term projects. Around 3:30 p.m. the real action begins, when he arrives at the arena and orchestrates a massive camera setup with his staff. When he first started shooting games, the operation consisted of only him and three cameras. Now it includes multiple assistants and more than 30 cameras mounted in “every nook and cranny” in the arena, he says. All of those are wired into a central “brain,” which allows him to fire all of them simultaneously. Not every NBA lensman comes to the arena with 40 cameras — Bernstein helped to invent the technology that allows him to cover games with the massive installation of cameras you’d expect monitoring the floor of a Las Vegas casino. Even with all that firepower at his fingertips, Bernstein still spends most games under the basket, behind a single lens. He is an old-school photographer at heart, though he commands one of the most advanced camera fleets ever assembled. “Sometimes I use the remotes because I know one or two get the shot and it might be blocked by the other four or five,” he says. “Sometimes you get lucky and you hit the jackpot and all your remotes get a really cool angle of that particular moment, mostly a dunk or a blocked shot or some kind of crazy scoop under the basket. Many of your remotes might actually get a nice shot of that. 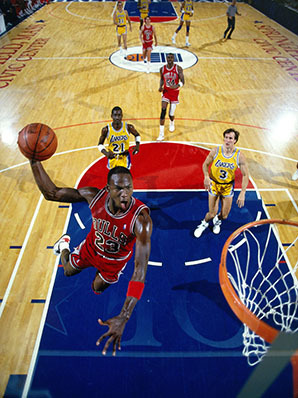 But the best picture Bernstein ever got of Michael Jordan, His Airness, was sitting completely still. It was just after the Bulls won their first title, in 1991. Chicago knocked off the Lakers in five games, and Bernstein snapped a picture of Jordan hugging the championship trophy with his dad. The image is a piece of basketball history. “I didn’t have an idea in terms of how iconic it would end up being, because it was just a moment in time that happened,” Bernstein says. “Some kind of other-wordly device told me to turn and take that picture. I was concentrating on what was going on at the podium at the time and the bedlam in that tiny little visitors’ locker room at the Forum. When they were desperately trying to find Michael to bring him up to the podium for a live interview, I instinctively turned to my left. “I was standing on a table in the middle of the room and, boom, there he was in the locker, 90 degrees from me, with his dad, holding the trophy, hugging and crying. It was one of those moments that time just stopped. I clicked two shots — boom, boom — and someone grabbed him. The seas parted. There were people all around him and it was just a bizarre circumstance. I turned, and two or three people who were right in front of him, between he and I, just separated, and I had a clean shot. The Jordan image is just one of many Bernstein’s snapped over the course of his legendary career, significant not only because it was Jordan’s first of six championships, but because the moment Bernstein captured was a launching pad to one of the great careers in sports history. The picture also set the tone for Bernstein’s career, which has placed him in the room with the Larry O’Brien trophy every year since. His job when the final buzzer sounds is to track down similar moments, which he does with a combination of instinct and skill. Bernstein’s made a career out of being behind the camera. But when the games are all over and the last of the photos have been catalogued, don’t expect to find him lugging one around when he’s alone with his family. That, and to not worry about Shaquille O’Neal falling out of the sky.